“What’s the green round thing in the share? 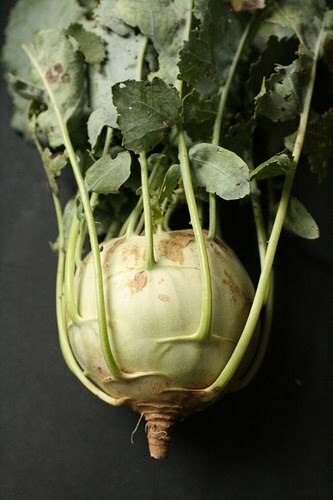 Tastes kind of like a cross between broccoli and turnip.” No less than ten shareholders have asked about the kohlrabi in Saturday’s winter CSA share. It tickles me to present folks with this “new” treat. The Boston Sustainable Food Examiner has a nice recipe for it, along with a couple of your fall apples. The photo below comes from thebittenword.com’s photostream. My daughter was eating this as fast as I could slice it. Since it was so large, I assumed it would be woody and strong flavored. I was planning a ham & kohlrabi gratin (http://www.eatingwell.com/recipes/kohlrabi_ham_gratin.html) but after tasting it, I wish we just ate it raw. Yum!